"Six men and three women - against the sea, and each other!" 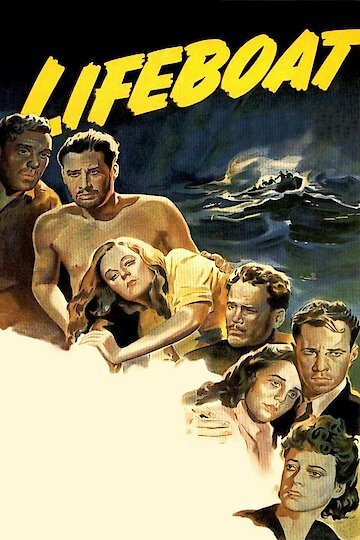 A German U-Boat sinks a ship during World War II and several people end up adrift in the middle of the ocean on a lifeboat. The survivors are all American or British, but then they pull another survivor into the boat, and he has a German accent. He may actually be the Captain of the U-Boat which sunk their ship -- the U-Boat was also destroyed in the sea battle. Tensions mount as an enemy appears to be among the survivors. Should they throw him overboard? Or perhaps he is innocent after all? Lifeboat is currently available to watch and stream, buy on demand at Amazon, Vudu, Google Play, FandangoNow, iTunes, YouTube VOD online.